MARINA INN SAN FRANCISCO IS PERFECT FOR BUSINESS TRAVELERS VISITING S.F. Choose affordable San Francisco lodging conveniently located near Fisherman’s Wharf and other great San Francisco attractions. Experience affordable lodging in San Francisco near the Fisherman’s Wharf, but tucked in one of the city’s most charming neighborhoods. The historic Marina District features stately, colorful homes and pretty courtyard gardens with access to shopping on Lombard and Chestnut Streets. One of the area’s landmarks built in 1924, Marina Inn has been restored and updated to offer modern amenities in a quaint, budget friendly bed and breakfast atmosphere. Close to the city’s transit system, our lodging offers the best of San Francisco nearby, including Fisherman's Wharf, Fort Mason, Palace of Fine Arts, Union or Chestnut Street shopping districts and the Exploratorium. The Inn is also a short ride to city center and the financial district. 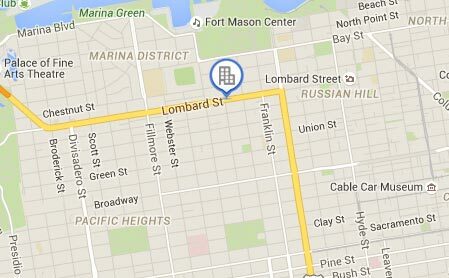 Rest assured, the Marina Inn is centrally located to the most celebrated San Francisco attractions. Voted by Fodor’s and Conde Nast as one of the best-kept secrets in San Francisco Bay, our bed and breakfast offers comfortable rooms inspired by English country style and old-fashioned hospitality. Enjoy conveniences such as wireless Internet and a cable TV in our well-appointed rooms in San Francisco. We also offer accommodations with bay windows. Marina Inn offers cheap San Francisco lodging without sacrificing quality and comfort. We blend a quaint vintage style with the modern comforts that make a stay so relaxing and worry-free. Each of our 40 San Francisco Bay hotel rooms has a Queen bed, or a Queen bed and day bed — perfect for a romantic getaway or family vacation with the kids. Old-fashioned floral wallpaper and a pine bed give the rooms a period appeal without being fussy. All of our guestrooms are ADA Defined service-animal friendly. Many Marina accommodations also feature traditional bay windows and other attractive architectural details. You’ll enjoy the wealth of room amenities that include cable TV, private bath, electric door locks, wireless Internet, direct dial telephone, alarm clock, hair dryer, rollaway beds, cribs, and San Francisco city guides. More than just affordable lodging in the San Francisco Bay Area, Marina Inn offers modern comforts and a professional staff that will gladly help you make the most of your trip. Our warm service reflects the hotel’s charming atmosphere and ensures a relaxing stay for every guest. Amenities include electronic door locks for rooms and lobby entrance, complimentary continental breakfast, 24-hour concierge, business center kiosk with a computer and wireless Internet, interior corridors, free newspaper in breakfast area, limited street parking, elevator, barber shop, and nail salon. In the morning, awake to a wonderful complimentary continental breakfast, complete with freshly baked goods, coffee, and juice. Then, take a short stroll to fantastic entertainment and shopping on Chestnut and Union streets, explore nearby Fisherman's Wharf or the many other area attractions. Enjoy complete hotel amenities at the Marina Inn in San Francisco Bay, CA. For a family-friendly vacation, children 5 and younger stay free! Sorry, we do not allow pets. The Marina Inn offers easy access to shopping, sightseeing, and recreational activities in the Marina District, as well as in nearby areas such as Fisherman's Wharf, Ghirardelli Square, and the Golden Gate Bridge. It’s safe to say that you’ll never run out of things to do in San Francisco. Check out shopping on Chestnut Street and Union Street. If you get hungry, a few of our guest favorite places to eat include A16, Eastside West, Emporio Rulli Gran Cafe, Greens, Isa, Night Monkey, Pacific Catch, Cozmo’s Corner Grill, Cafe Maritime, and Cybelle’s Pizza. Or take a stroll down to Chrissy Fields and see the views of The Golden Gate Bridge. If you're attending a specific San Francisco Bay area event, choose Marina Inn for a great deal during your stay! Our helpful concierge will also assist you in planning San Francisco activities to make your vacation a fun and exciting experience.